Bessie Faye (Allen) Hackworth was born on November 9, 1931 in Aliceville, Alabama to Luther Dalton and Florence Odell (Lindsey) Allen. She passed away September 8, 2018 in Chandler at the age of 86. Bessie grew up in Aliceville, Alabama where she graduated high school. She married Auzzie Miles Warlick and moved to Oklahoma City in 1950. They raised three children together. Faye completed beautician’s school and obtained her license after moving to Oklahoma City. Auzzie converted their garage to a home shop where she styled hair for several years. In 1964 they moved to Carney, OK where she continued working in a small beauty shop behind the Carney Bank. She later took a job in food service and worked as a cook in the OSU athletic dorm in Stillwater. Although she always loved her Alabama football team she became an OSU fan after getting to know many of the players. She later married Donald Hackworth. Don and Bessie enjoyed many years together and briefly opened a donut shop in Carney where her donuts were a hit. After moving to Chandler she worked in food service again at the Pioneer nursing home. She loved music, especially country and Elvis, dancing, her family, her friends, traveling, Alabama, John Wayne and long hard laughter. Of all her loves in life her children and grandchildren were the greatest. She never tired of having them under foot and was always there when any of them needed her. She will be lovingly remembered and tremendously missed by them all. Bessie was preceded in death by her parents; two husbands; brother, Bill Allen; sisters, Jackie Pate, and Murel Allen. Survivors include her sons, Rex Warlick and wife Debi of Del City, Lindsey Warlick of Carney; daughter, Deborah Robinson of Agra; sisters; Betty Lou Tilley and husband David, Janet Rester and husband Thomas; (16) grandchildren; (31) great grandchildren; (3) great-great grandchildren along with other family and friends. A funeral will be held at 2:00 p.m. Wednesday, September 12, 2018 at the Lehman Funeral Home Chapel with Reverend Donnie Huffman officiating. Interment will follow in the Carney Cemetery. 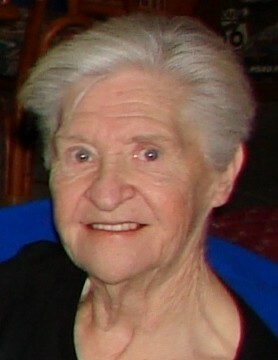 Donations can be made in honor of Bessie to the Alzheimer’s Association, http://www.curealzfund.org/. Arrangements are under the direction of Lehman Funeral Home of Wellston.